Tour will be required to start too early at 5:00am as you can pack breakfast along with you or you can eat breakfast at any good restaurant along the way & lunch the same also as we eat along the way. Koh Ker Group located in the province of Preah Vihear, it was briefly the capital of the Khmer empire between 928 and 944 under king Jayavarman IV and his son Hasavaraman II. After the Khmer empire had been established in the Angkor area (Roluos), Jayavarman IV moved the capital in 928 almost 100km northeast to Koh Ker. Here a vast number of temples were built under his reign, until his successor returned to the Angkor area about twenty years later. 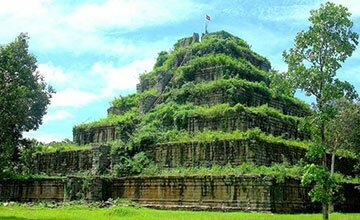 The Koh Ker site is dominated by Prasat Thom, a 30 meter tall temple mountain raising high above the plain and the surrounding forest. Great views await the visitor at the end of an adventurous climb. Garuda, carved into the stone blocks, still guard the very top, although they are partially covered now. Across the site of Koh Ker there are many prasat or tower sanctuaries. A couple still feature an enormous linga on a yoni that provides space for several people. The outlet for the water that was sanctified by running it over the Linga can be seen in the outside wall of one of them. In other cases, three prasat stand next to each other, dedicated to Brahma, Shiva and Vishnu. Most of them are surrounded by libraries and enclosures, many also had moats. At that time, the roofs were still made of wood. Today, only the holes for the beams remain in the stone structures. Perng Kamnou : On the hillside or on the foot of Mount Kulen in the east of Svay Leu district of Siem Reap, large, scattered natural stone blocks are designed with sculptures. The beautiful Khmer ancestor of the 11th century was the era of Havarmavarman III. The first stone on the western side of the Hindu temple in Hinduism is the Vishnu statue on the Dragon, whose god is on the pink. Growing out of Vishnu’s. The second panel opposite the carved statue carved 8 hand mirrors, along with 3 vertical penises with an ambient frame. Tabernacle 3 is located at the east of the Tabernacle, with many statues as well as inscriptions and animals. Approximately 40 meters from the drawing, the 4th stone is a goddess of Vishnu, standing on the northern edge of a pillar, and the other one is in the second pillar And third, there is a pair of fish. 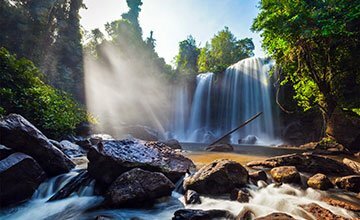 Beng Mealea Temple (its name means “lotus pond”) located at the foot of Kulen Mountain. It was built as Hinduist temple, but there are some carvings depicting Buddhist motifs. Its primary material is sandstone and it is largely unrestored, with trees and thick brush thriving amidst its towers and courtyards and many of its stones lying in great heaps. 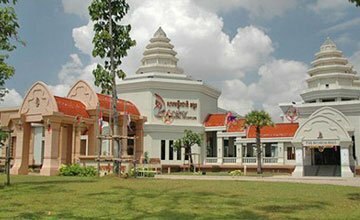 For years it was difficult to reach, but a road recently built to the temple complex of Koh Ker passes Beng Mealea and more visitors are coming to the site. Built in the 12th Century, many scholars believe it was the model for Angkor Wat. It is just as wonderful of a temple but it is still largely lost in the jungle.